Taking care of your plumbing system, and managing your water consumption behaviors isn’t rocket science, by any means. However, you might be surprised what fairly common, detrimental mistakes so many Lubbock homeowners make every day. These mistakes can build in severity over time, and snowball into major plumbing disasters if left unattended. Easily, the worst thing you can do to your home plumbing stems from negligence; ignoring the warning signs of a pipe failure or other plumbing problems will only cause those problems to develop, and result in higher restorative costs later on. Common signs of a plumbing problem you should take immediate note of include persistent clogging, lawn indents, poor water pressure, and lawn moisture. If you notice any of these signs, do not ignore them or forget about them! By acting fast, you can mitigate not only damage to your plumbing, but the extent of later repairs. Very often, we see major plumbing damages as the result of negligent care; damages which are entirely avoidable with the right care and attention given. One of the worst things homeowners can do to their home plumbing systems is also one of the most common methods people use to “clean” their drain pipes. The fact of the matter is that these chemical cleaners can actually be very hazardous to your home plumbing system, and may even damage your pipes. The pressurized, foaming action and unnecessary additives that make these chemical solutions work are also what make them dangerous to your plumbing. If you routinely use these cleaners to resolve home pipe issues, you may actually be causing the erosion and breaking down of your own pipes! Over periods of use, these cleaners will naturally begin to eat away at the inner walls of your pipe. This corrosion can be completely avoided by merely choosing alternative methods of pipe clog repairs, such as natural, vinegar and baking soda cleanse solutions. These natural reactions work just as well as chemical cleaners in a pinch, and are much less damaging to your pipes. While seasoned DIYers can likely handle any minor plumbing problem with efficient ease, we often find average homeowners taking on huge restoration efforts on their own to save money; while it’s possible to fix your own plumbing without any prior experience, it’s unlikely to turn out that well. One of the worst things you can do to your plumbing is cause additional damage by getting in over your head with DIY measures. If you feel uncomfortable resolving a plumbing issue on your own, call Churchwell Plumbing for assistance. Often, professional repairs can be done much quicker than DIY repairs, and as it turns out, much cheaper. When unprepared homeowners attempt large-scale DIY plumbing repairs, they can actually increase their costs by using the wrong tools, or taking apart the wrong pipe fixtures. Even when homeowners finally make the decision to have their home plumbing professionally repaired, there is still room for mistakes to happen; most often, these occur when people opt for outdated repair options. These techniques, which are impractical given today’s technologies, are often overly intrusive and even damaging to properties, and cause more hassle than they’re even worth. This hassle is due to the physical digging, or “trenching,” of lawns during underground pipe repairs. These techniques can cost homeowners significantly in landscaping repairs, and take days to complete effectively. Fortunately, innovative trenchless technologies all but eliminate this need for digging, and can be finished in a timely manner. By using cured-in-place, epoxy-resin pipes and pressurized application, Churchwell Plumbing specialists can mend any pipe damage without actually excavating the pipe, and the area around it! Another common plumbing mistake we see here in Lubbock concerns how homeowners treat their drains, waste pipes and garbage disposals. To put things simply, by disposing of trash, grease and many food products, you contribute to drain clogging, buildup and long-term damage. Under no circumstances should you try to process animal bones, silverware, plastic ware or trash in your garbage disposal; as it turns out, everyday garbage is the last thing you’ll want to put down your disposal. Additionally, avoid running fat, cooking grease or oils through your drains, as these substances easily solidify within pipes, creating lasting flow problems for your plumbing if left untreated. We recommend cleaning your garbage disposal on a semi-regular basis with ice cubes and running water, as these can free problem-causing food debris. You should also run your disposal on a regular basis, as rust can develop and accumulate if it’s left alone for too long a period. One of the worst things homeowners can do to their Lubbock plumbing systems, particularly those in older homes built from 1945 to 1972, is let their aging pipes decay. Particularly, pipe deterioration occurs quickest in homes equipped with Orangeburg sewer pipe, as the tar paper materials these pipes are made of absorb moisture, and as a result easily deform with pressure. These sewer pipe systems have a life expectancy of around 50 years; as most were installed prior to 1972, that means their time is almost up. To combat this pipe degrading, the most proactive homeowners will have these pipes replaced before costly, damaging problems develop; here at Churchwell Plumbing, we’ve found that trenchless replacement is often the most effective and affordable way to do this. Avoiding all of the above plumbing mistakes, however, cannot make up for general negligence; a vast majority of major plumbing problems can be entirely preventable with routine and annual pipe inspections. For starters, you can diagnose your own pipe and drain problems from home, and check your plumbing performance before the need to call a professional ever arises, by evaluating your water meter and water flow on a monthly basis. However, that does not mean you should forget about professional inspections altogether. In fact, we suggest getting a specialist to look at your home plumbing systems at least once per year, as their trained eyes can catch troubling signs earlier and far more accurately than the average homeowner’s. 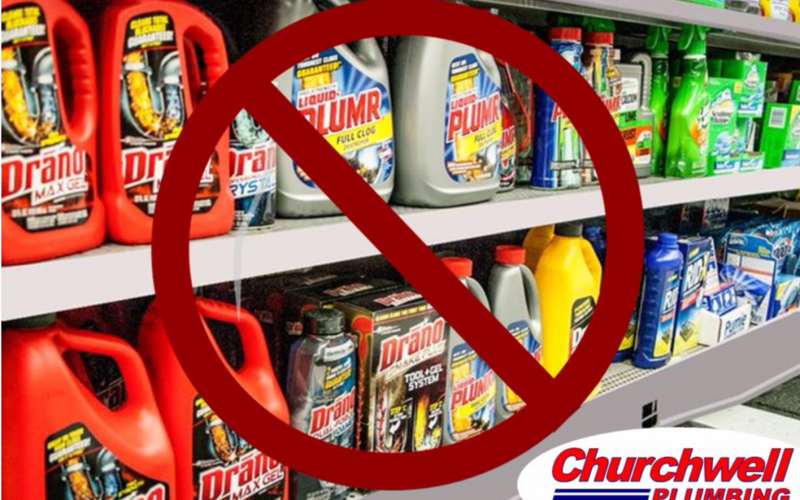 To learn more about what poor behaviors and water consumption habits to avoid when it comes to your plumbing, or for more information regarding drain repair and trenchless technologies, contact Churchwell Plumbing today, 806-744-4939.